It feels like yesterday when I organised the first Cracking the Frame evening at Rialto (we opened with a rocking screening of Blank City if you’re wondering..) and here we are, announcing the first screening of year three. Month after month, this unique program in The Netherlands entirely dedicated to art documentaries has grown a large loyal audience and attracted media attention. Many beautiful films and good memories afterwards, I am thrilled to launch another season of Cracking the Frame. We open in September with the Dutch premiere of a brand new documentary dedicated to the work, thoughts and feelings of one of the masters of modern photography, Saul Leiter. Wednesday 18 September, 19.30h at Rialto cinema Amsterdam. Internationally renowned for his abstract color photographs, Leiter has been a solitary and media-shy artist for most of his life. Never driven by the lure of success, while his work was featured in some of the most important museums around the world he remained more interested in expressing himself through his photographs and paintings than in building his own career. 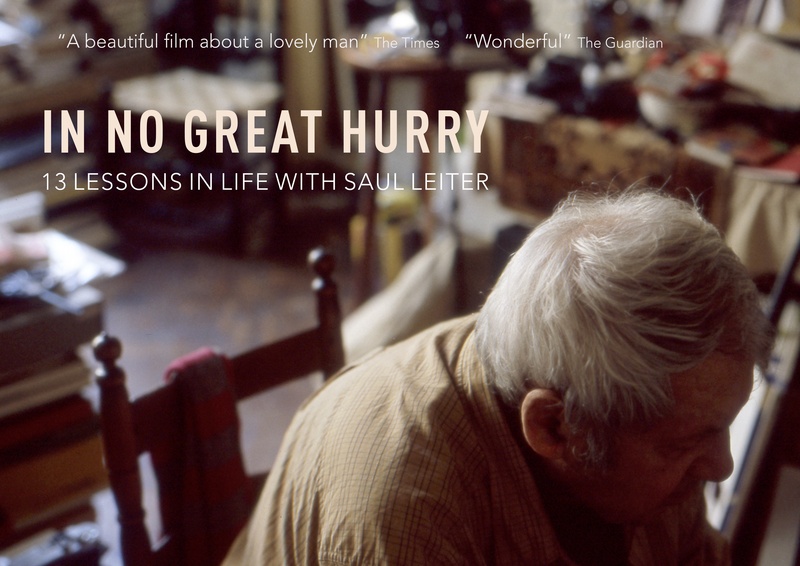 Broken down into thirteen lessons in life, IN NO GREAT HURRY follows Leiter as he talks openly about his life philosophy, deals with the burden of becoming world famous in his 80’s and tries to organize the huge archive of works and memories stacked to the ceiling of his apartment. An intimate, funny and moving film dedicated to work of a humble master and to the life-long search for beauty of an extraordinary man.